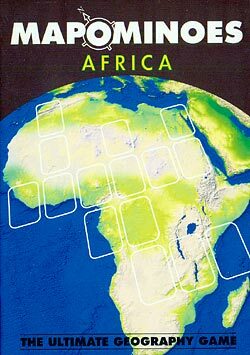 Mapominoes Africa is a portable game is fun, easy to learn, educational and highly addictive and makes a great present for any family member interested in geography or travel. 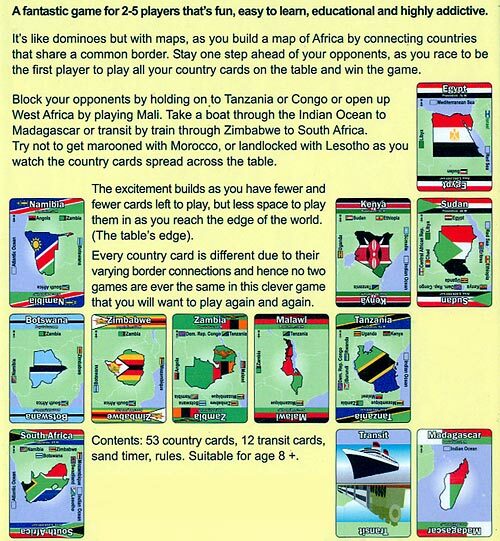 It’s like dominoes but with maps, as you build a map of Africa, by connecting countries that share a common border. Stay one step ahead of your opponents, as you race to be the first player to play all your country cards on the table and win the game. Block your opponents by holding on to Tanzania or Congo or open up West Africa by playing Mali. Take a boat through the Indian Ocean to Madagascar or transit by train through Zimbabwe to South Africa. Try not to get marooned with Morocco, or landlocked with Lesotho as you watch the country cards spread across the table. The excitement builds as you have fewer and fewer cards left to play, but less space to play them in as you reach the edge of the world. (The table’s edge). 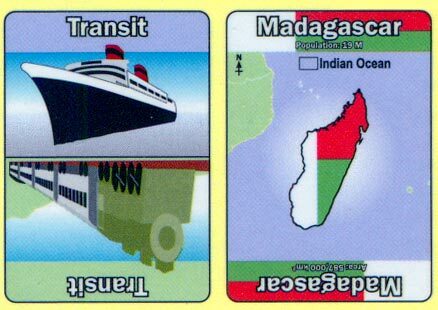 Every country card is different due to their varying border connections and hence no two games are ever the same in this clever game that you will want to play again and again. Play as a stand alone game or combine with Mapominoes games for other continents to make to expand the game to cover the world. A simple game with hidden strategic depth that gives it broad appeal to both children and adults. Suitable for 2-5 players. Age 8+.